Do you know what is lurik? Lurik is derived from the Javanese word lorek, which means stripes, and the charm of lurik cloth comes from the colorful stripes of the strands of yarn woven into it. Kalyca Montessori School held, on Tuesday, 22 January 2019 for Nursery class and Wednesday, 23 January 2019 for Preschool class. 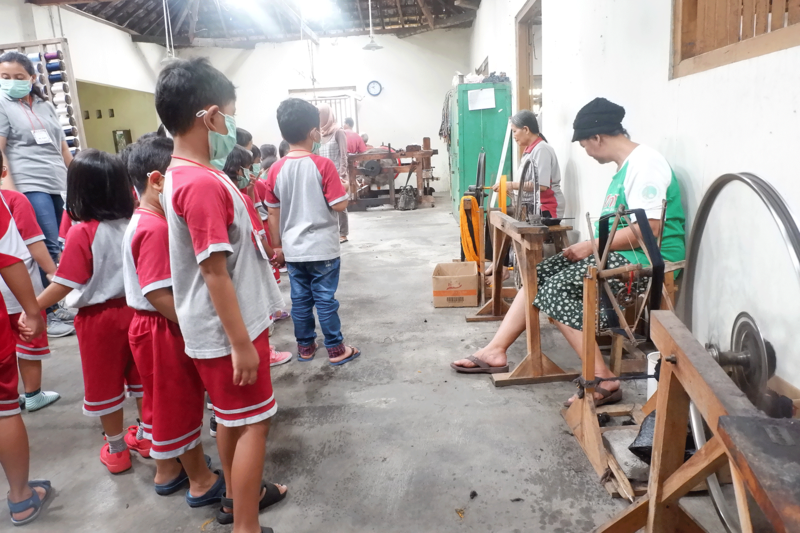 When arriving at the place, the students looked happy, because the display room was interesting with many kinds of clothes, keychain, pencil case, etc. There were two activities, touring and making frame from lurik. First activity was touring. The students enjoyed and looked excited during the activity. 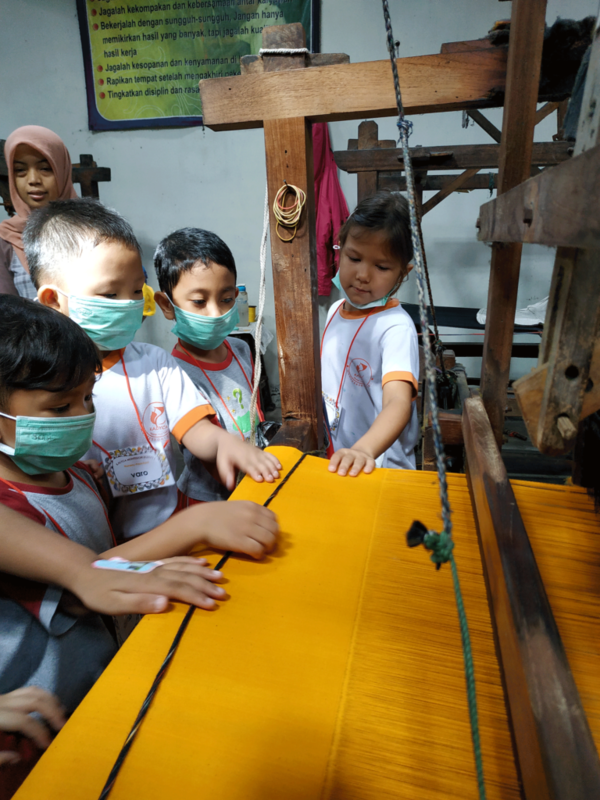 They were led by the guide, Kak Ayu, to watch the process of making lurik, started from coloring the white yarn into colorful yarn, inserting around 2000 yarns into the small hole as a part of weaving machine, then weaving them together become beautiful combination of colors. The most interesting part beside the process itself was the lurik maker. Mostly, they were elderly people. But, they showed their passion in doing them wholeheartedly. We learned much from them about diligence. Next, the second activity was making photo frame from lurik. 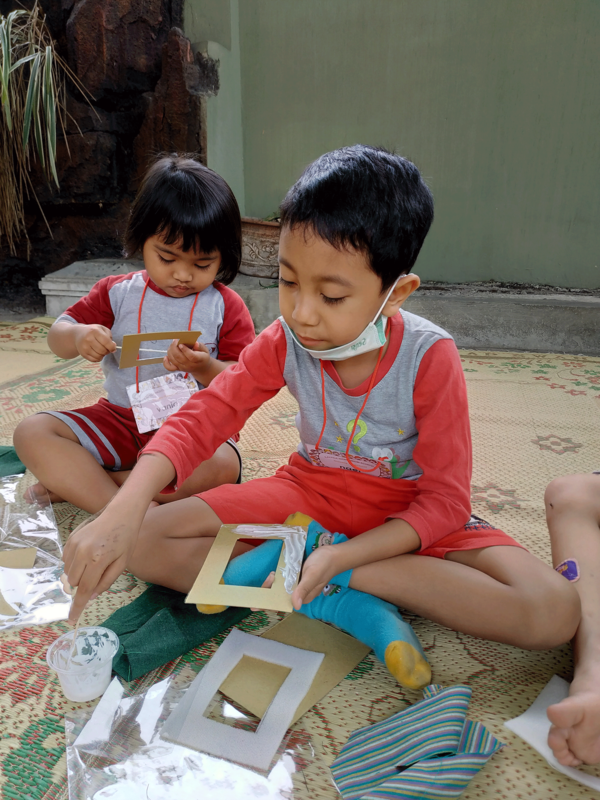 Each student got a set of frame materials which consist of : lurik, card board, plastic, glue, and ice cream stick. This activity was led by Bu Vita. She explained and showed the steps of making frame patiently to the students. They willingly and excitedly did it by themselves, even though some of them still needed guidance and help to finish the frame. Finally, it was time to say goodbye to Kurnia Lurik. The students looked happy experiencing new place and activity. Besides, they were satisfied for making frame from lurik by themselves, and showed it to their parents. See you in next minitrip!